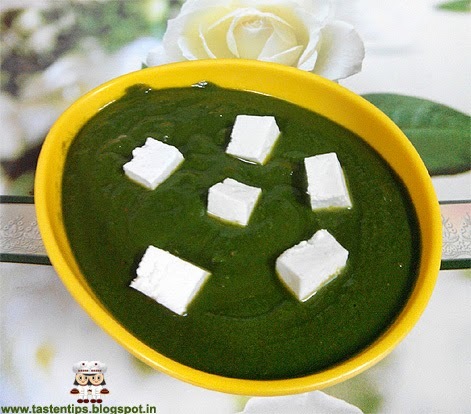 Palak Paneer or Saag Paneer is one of the most popular, delicious, hearty North Indian dish prepared with spinach and cottage cheese. 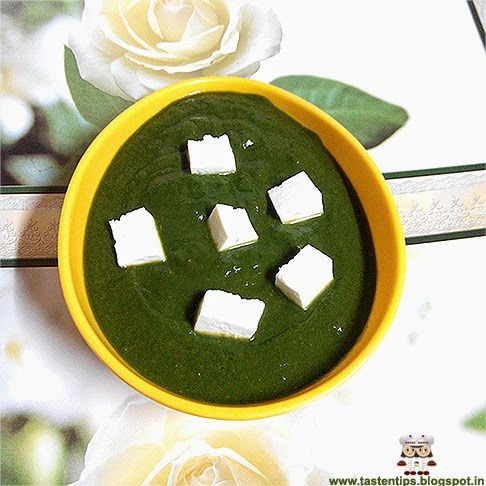 The smooth and creamy consistency of spinach, melt in the mouth paneer cubes and spices give it a delightful flavor. blend of taste and texture. The paneer in this recipe can be fried to add some extra flavour. 1. Remove stems pf spinach leaves and wash in running water. 2. Blanch it in boiling water for 2-3 mins. Drain out water. 3. Grind spinach into a fine paste. 4. Dice paneer into small square pieces. crackle, add ginger-garlic paste, stir for 1/2 min. 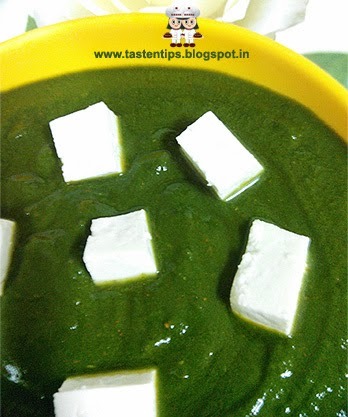 spinach puree & mix well. Add water if required. mix well. Let it boil for 1-2 mins. 9. Transfer into a serving bowl & serve hot. the color of spinach will remain good. My Fav sabji... and tempting pics..
My family's favorite gravy!!! Looks very vibrant and tasty!!! !you have a nice blog here!! !